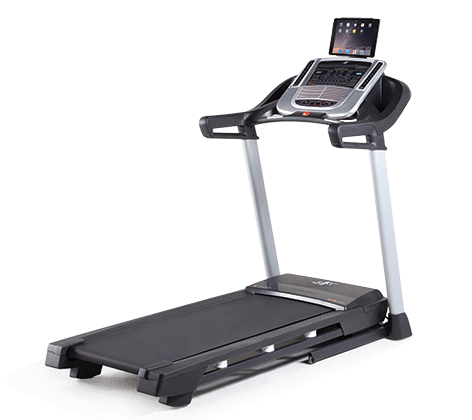 If you are looking for a quality budget treadmill from a respected treadmill brand, then you should consider the NordicTrack C700. It has a thick, 2-ply non-stretch treadmill belt and a 2.75 CHP motor which will hold up under years of use. With a smaller motor, it is better suited for those looking to use the treadmill for walking and some jogging. You can sync up with iFit via the C700’s built-in Bluetooth, so you can access more features with the iFit app. So, while it isn’t the fanciest treadmill from NordicTrack, it is the most affordable and worth the price for what it can do. The C700 retails for $999 but is often on sale for $799. Be sure to check out our best price button so you can also add our exclusive coupon. Need an affordable treadmill - Many quality treadmills have a rather large price tag to match. NordicTrack did not skimp on quality when they made the affordable C700. Want to primarily walk - Walkers who want a good treadmill will like the C700. It can handle some jogging but it is primarily suited for walkers. Have size restrictions - The C700 is a compact treadmill which can comfortably fit in any size of dwelling. It also has a helpful hydraulic system to make raising and lowering the deck easier. The C700 is a steady, lightweight machine which should appeal to people on a tight budget. Clean interface - We’ve grown accustomed to the touchscreens most NordicTrack treadmills have as displays. However, the LED display was easy to read and the console was effortless to navigate. Decent motor - The motor on the C700 a 2.75 CHP motor. It is strong enough to run the treadmill smoothly as well as quietly. Good cushioning - With FlexSelect™ cushioning, you can adjust the amount of cushion the C700 has on its deck. The C700 is a great budget treadmill and a good option for those looking for a walking treadmill. Footprint In Use (W, L, H): 36" x 73" x 67.5"
Running Area - The running area of the C700 measures 20-inches wide and 55-inches long. It is not as long as the C900, but as the C700 only inclines to 10%, users won’t feel like they are going to fall off the back end. Weight Capacity - The highest weight the C700 can accommodate is 300 lbs. Folding - The C700 can fold up compactly. With the EasyLift™ hydraulic system, you can easily raise and lower the treadmill deck. Space / Footprint - Small and light, the C700 measures 36" wide, 73" long, and 67.5" high. It folds up compactly and can be easily moved if you need to store it somewhere. Max Speed - The treadmill’s max speed is 10 MPH. There are other treadmills in this price range which can reach 12 MPH but it should not make a difference to the main users of this treadmill if all they want is walking. Incline - This treadmill has an incline range of 0% to 10%. The ability to incline up to 10% will give walkers a challenge as they use the C700. Workout Apps - There are 20 different workout programs for users to choose from when using the C700. Aside from the manual setting, there are incline, calorie, and speed workout programs. Display - With a multi-windowed LED display, you can track your workouts on the C700. The data you can choose to have displayed is your heart rate, calorie burn, distance, time, speed, and incline. Speakers - There are two, 2” speakers located along the bottom of the treadmill display. They have good enough quality that you can use them while running the treadmill. Fans - The C700 fan can automatically adjust to the user’s workout intensity. Or the user can adjust the speed of the fan depending on their preference. The fan is mounted directly under the display in a fixed position. Heart Rate Monitoring - EKG handlebar grips are the only way to measure your heart rate on the C700. They are not very accurate but should do decently for a walker using the C700. One of the great features on NordicTrack’s C treadmill line is their FlexSelect™ cushioning. Users can decide to alter the cushioning level by twisting the 6 different cushioning points. So if you prefer a less cushioned treadmill deck, it is only a few twists away. The side rails of the treadmill are slightly slanted with textured footing. The molded plastic is firm underfoot, so users should be able to feel comfortable standing on them. Buyers of the C700 have a 30-day trial period with their new treadmill. If the purchaser chooses to return their treadmill during the 30-day period, they will be able to receive all their money back. There will be a 10% restocking fee for any returns, except for defective or damaged treadmills. The C700 is a good, affordable treadmill. It is built well enough to stand up to daily use by a couple users and is best suited to walkers. We would classify it as a starter treadmill; one to help the user back into working out. If you are a walker looking for a treadmill or someone easing back into regular exercise, then we would recommend you consider the C700. Buy directly from NordicTrack for the best prices on your C700. They will make sure you receive the latest model of the treadmill you order, and take care of any problems which may arise. Be sure to use our exclusive coupon button above, so you can secure the best price.